Hyundai has teamed up with California-based tuner John Pangilinan to build a highly-modified Tucson for the SEMA show. Called Tucson Adventuremobile, the one-off model was designed to go far off the beaten path. It is fitted with a two-person Treeline Tamarack tent that's mounted on a special roof rack, and with a solar panel that generates enough electricity to power most of the accessories needed on a weekend-long camping trip. A lift kit, a bull bar and all-terrain tires emphasizes the crossover's off-road chops. Pictures of the interior haven't been published yet, but John Pangilinan has added Katzskin leather upholstery, green seat belts that match the Tucson's paint job, a battery charger, additional sound-deadening material, LED ambient lighting and a Clarion stereo. Hyundai promises it has given the Tucson a few more ponies by installing a new intake, a charge pipe kit, and a Magnaflow exhaust system. However, the company hasn't revealed which engine the SEMA-bound concept is powered by. 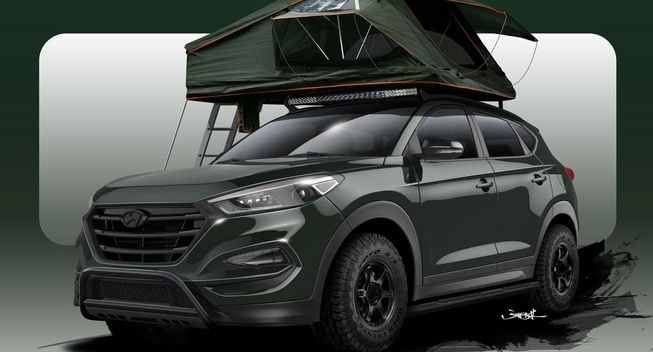 The Tucson Adventuremobile isn't the only one-off Hyundai that SEMA show attendees will get to check out. The South Korean car maker will also show a 500-horsepower Genesis Coupe, a RPG-tuned Tucson, a 500-horsepower Veloster Turbo and a heavily-modified Tucson with 700 ponies on tap.